Damascus Celtic Swords for sale are 24 inches in all. These popular Celtic swords feature a beautiful design including a bone, wood and horn handle offset by a Damascus steel blade. The 18 inch blade features three blood grooves and the distinctive Damascus flowing wave-like pattern. The steel blade is offset by the gorgeous bone handle that is bordered by horn and light brown wood. The stainless steel pommel caps the top of the sword. 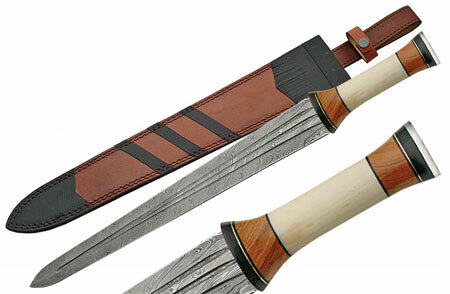 These swords include a custom scabbard for $99.99.